A lot of research says that creative people see connections among things that most other people do not. Put together post-war Italy, the movie business, the Catholic Church, male friendship, and the last bond of a life mentor, and you have Giuseppe Tornatore’s masterpiece film Cinema Paradiso. Connect the Eric Whitacre unique choral work Lux Aurumque with 185 voices from around the world in a virtual environment, and out comes a lush performance that has become an Internet sensation. Combine our a New York poet in the late twentieth century dying of AIDS and the English writer Virginia Woolf at the turn of twentieth century, and voilà: Michael Cunningham’s inventive novel The Hours. Weave together close-up photography and abstract painting, and the result is Chuck Close’s stunning color portraits. No doubt about it: Great works of film, music, literature, and art have in common the creator’s talent for linking the unlinkable. At that time, the BlackBerry had not yet entered the market. The iPod, the iPhone, and the iPad were a few years down the road. Yet Armstrong already knew that his developers imagined the possibility of connecting nearly every data delivery and storage system imaginable into a palm-sized device that could allow the owner to wirelessly, quickly, and globally make phone calls, e-mail, instant message, chat, and browse; make and view videos and photos, play games, schedule appointments; use as an alarm clock, calendar, compass, flashlight, and stopwatch; manage applications usually reserved for desktop computers; and store vast amounts of data. The hard-to-imagine is for the consumer; the make-it-happen is for the producer. What does this idea mean to writers at work, whether they’re composing short stories or client proposals? Engage yourself and your readers by seeing connections among disparate points. Join any two people, places, events, or objects in the same place at the same time or, for that matter, in the same place at different times or different places at the same time. Something interesting is bound to happen. As a college student, I heard from a writing instructor this tip: “Just write about anything without stopping; this kind of free association will lead to something.” I was skeptical. Until that moment, I had learned that my job as a writer was to compose a perfect first draft from a specific prompt in a given time, usually 15 to 30 minutes. Who had time for such nonsense? How can writing about anything possibly lead to something? It turned out that this piece of advice was one of the best tips that I have ever heard—and one of the best tips that I can give to developing writers. What I was taught before that lesson was to stick around until some authority imposed on me a writing topic and to respond on demand with an unrevised, unedited draft before the class was over. That procedure might work well in a classroom to sort the fast writers from the slow ones, but it does not necessarily sort the exceptional writers from the unexceptional ones. Good writing takes time. You can read interviews of hundreds of successful, famous writers who will say that they spend a good amount of time researching, sketching ideas, and rewriting—none of which fall in to the drafting step of the writing process. Lower your standards. You might be your own worst critic, so you’ll want to expand your tolerance for nonsense. Accept irrelevant ideas, inaccurate information, poor organization, illogical transitions, dreadful style, grammatical mistakes, and poor spelling. You will catch all these issues during the rewrite. 2. Broaden your vision. This does not mean that you should look far and wide for ideas to write about; it means that you should broaden your perspective of what is acceptable to write about. If a proposal for buying a smartphone is your topic and you’re stuck with only memories of your last trip to the Canadian Rockies (as I once was), then write about that hike up a mountain trail past that glacial lake. All roads lead to your topic. 3. Enjoy the game. Free association is truly about play. Allow yourself the luxury of having fun. No one is writing for you, nor is anyone watching you write, and for now you are writing to no one but yourself. So what do you have to lose? Delight in the ideas that pop into your head and follow them with your fingers as you document all that you imagine. Here is a brief excerpt of a free association exercise I did on a smartphone proposal, which did include a passage about the Canadian Rockies! Three weeks in the Canadian Rockies. Awesome. Seven national parks in twenty days: Jasper, Yoho, Mount Revelstoke, Glacier, Kootenay, Waterton Lakes, and Banff. Not quite a thousand miles of driving and far more than a hundred miles of hiking. Up dense forests leading to clearings at the edge of mile-high mountains overlooking pristine lakes radiating from glacial flour. No one in sight. Amazed that I was able to receive a phone call half-way up from Lake Louise from a client, the US Navy. The signal didn’t work at ground level near some populated areas, but here I am talking to a Navy SEAL based in Virginia Beach some 2,500 miles away. Crazy. I can’t even get someone in Manhattan from my mobile phone when I’m riding a New York City Transit subway, but I’m on subways for only a few minutes at a time. That’s why I need a smartphone, so I can communicate by voice or text from remote areas with clients whenever and wherever they need me. The last sentence was the beginning of my proposal. The stuff before it, which made for nice memories, was for my scrapbook. Those 144 words before the last sentence took me just three minutes to write, but it got me going. Starting with this post, I cover seven ways for writers to keep their creative juices flowing. Before offering the first tip, I should define writers and creativity. I am referring not only to writers of fiction, essays, plays, and poems, although many of you who see yourself as falling into these categories would also benefit from this series. I also mean business, technical, and reportorial writers, those administrative, technical, and professional staff who must write every day, many even more than writers of the so-called creative realm. Frankly, I consider all writers—on-the-job writers as well as storytelling writers—creative writers if they are to survive successfully in a career of pounding the keyboard of their computer to communicate with people. As for creativity, I do not necessarily mean the conveying of profound ideas on the order of a Kazantzakis, de Beauvoir, Chekov, or Neruda, although profound ideas do come from creative minds. By creativity I mean the creating of words on a screen or on a page that were never before created in just that same order to that same audience by you or anyone else. Yes, I do believe that creativity is necessary for writing a proposal to management, responding to challenging questions from prospective employers, composing a commendation of coworkers for a job well done or a speech honoring family members at a special occasion. If these messages are not canned—if they are to be original—then they demand creativity. So here is my first of seven tips: brainstorm. List all the ideas that come to mind related (or even unrelated) to your topic. Do not judge whether your ideas are good, bad, or somewhere in between. Just generate ideas. You can move, add to or delete them later. For example, right now I’m looking out a window into the dark at 5:15 a.m. Never mind that I’m in an unattractive hotel room. I need to write a description of this area for you before daylight arrives, so I’m pretty much working from memory but I can hear plenty, including the roar of traffic from a nearby highway and a couple of hotel workers passing by chatting, presumably in Hindi. My brainstorming results in the following unorganized list. Note that some of these observations are from earlier glances out the window in broad daylight, as I can’t see much. Cut and paste them in a logical order, adding and deleting as I see fit to continue my list until I’m ready to write a few descriptive paragraphs. Start my draft immediately from any of the 12 points that move me forward. I might not use all 12 points; in fact, I might not use any at all by the time I’m finished. But I am so ready to write, just itching to keep my fingers moving. I get the feeling that I am talking to everyone I ever met, but it’s just little old me sitting alone in a hotel room writing at a laptop and being creative. Videojug is just the sort of website designed for people who want to learn in a heartbeat. Claiming over 60,000 free, professionally produced how-to videos to help viewers “get good at life,” Videojug offers videos on writing on specialized writing topics that run anywhere from one to five minutes. Topics include letters of apology, application, complaint, condolence, fundraising, persuasion, rejection, retirement, and sympathy. These videos are worth a view if you are new to the business world because the videos are methodical and easy to follow. Reading Like a Writer: A Guide for People Who Love Books and for Those Who Want to Write Them by Francine Prose. Harper Collins, 2006. 288 pages. 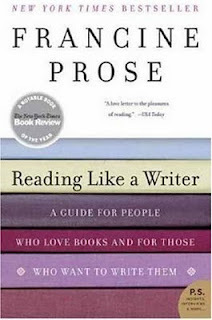 Francine Prose is a lover of books who found an eternal literature classroom by reading the masters of prose. She is also a terrific writer who uses engaging anecdotes and examples to cover such topics as character, dialogue, and narration, as well as the more technical matters of paragraph development, sentence structure, and word choice. She spins one interesting yarn after another through references of great literary passages. In the process, the author proves that command of language and inventiveness of human elements surpass plot in captivating readers. The subtitle of the book rings true: either the bibliophile or the neophyte author will benefit from reading it.